OAKLAND — The attorney representing the accused killer of Chauncey Bailey was threatened with sanctions Friday for skipping a scheduled hearing at which a trial date was supposed to be set. Now the trial of Devaughndre Broussard will not begin until, at the earliest, late April, said Chris Lamiero, a deputy district attorney handling the case. 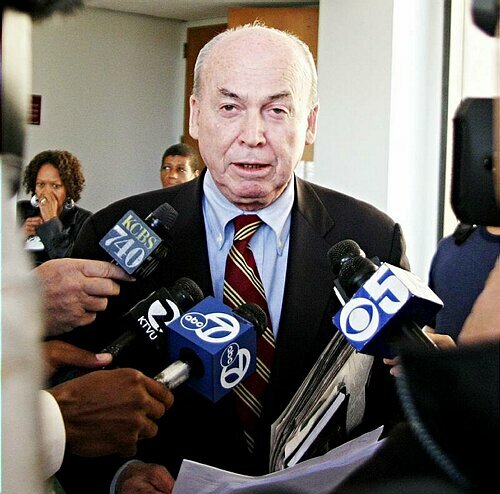 Alameda County Superior Court Judge Morris Jacobson threatened Broussard’s attorney, LeRue Grim, with sanctions because he did not appear in court at 9 a.m. The hearing, in fact, was delayed more than two hours in hopes Grim would appear, but he never showed up. Jacobson said that if Grim does not appear in court at 9 a.m. on Feb. 20, he will fine the San Francisco-based attorney. Broussard is accused of killing Bailey as the journalist walked to work Aug. 3, 2007. Oakland police say Broussard admitted to the killing, saying he did so because Bailey was working on stories about the decline of Your Black Muslim Bakery. Broussard’s attorney, Grim, has argued his client is innocent and was coerced into giving a confession because bakery leader Yusuf Bey IV promised to help him get out of jail if he took the fall for the killing. Although Broussard is the only person charged in the murder, investigations by several media outlets, including the Chauncey Bailey Project, have raised serious questions about whether bakery leader Yusuf Bey IV is responsible for the murder.